In 1906, Libby, McNeil, & Libby, a Chicago-based meat-packing company, opened its first fruit-packing factory in Sunnyvale, California, shortly after the city’s incorporation. 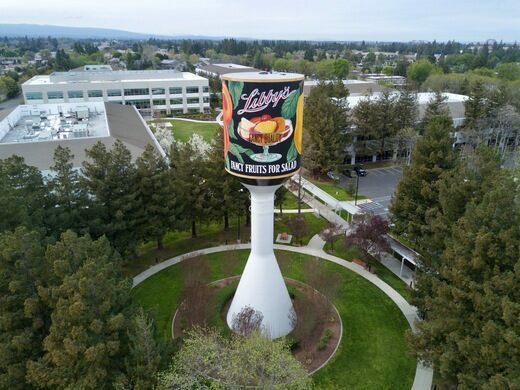 With bountiful peach, cherry, and apricot orchards nearby, as well as immediate access to the railroad, Libby’s boomed, quickly becoming the largest employer in Sunnyvale and, by 1922, the largest cannery in the world. The factory closed in 1985 and the property was razed and turned into an office park, sparing only the water tower. 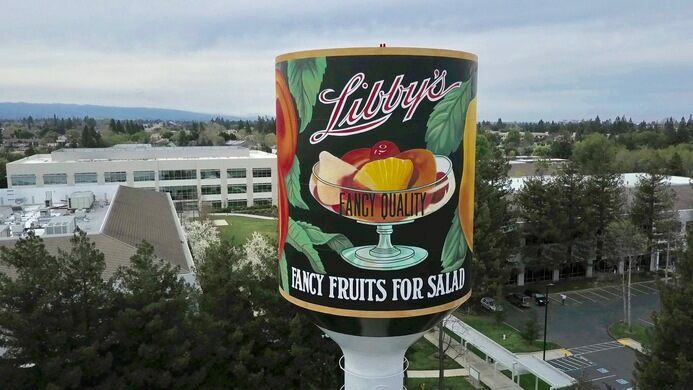 During the facility’s heyday, the water tower was the primary source of water for the old cannery and had been painted to resemble a can of Libby’s fruit cocktail, updated every so often to reflect the changes in Libby’s labeling. The can is approximately 25 feet tall and 15 feet across. It stands about 150 feet in the air and is visible from several areas of the city. However when the factory was torn down, the tower was painted over, removing the distinctive Libby’s label. Incensed, the residents of Sunnyvale protested the change, and the top of the tower was repainted to look like the first Libby’s fruit cocktail label from the early 1900s. Today, the tower still stands in the midst of a generic office park, identifying the former site of the factory that once employed nearly the entire city. The water tower is located in a small grassy area in the center of an office park off W. California Avenue. Once you pull into the parking lot the tower is pretty hard to miss.